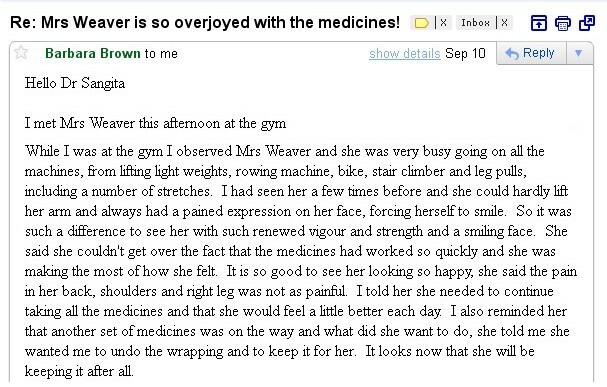 _ 74 years old lady, Mrs. Maria Weaver was suffering from Osteoarthritis for the last 10 years. She was low in energy, more tired than normal and her limbs were very weak (very difficult to lift her arms). Sometimes her heart beating very fast, comes over hot and sweaty. This feeling comes and goes, The joints of two fingers on her right hand were quite swollen. Had a corn on the joint of her right foot, (very uncomfortable) keeps coming back each time it is treated. In just a week time she was able to go back to the Gym and was able to do things which she had not been able to do for long time.